For more practice guides, visit about MBX-12, Warm-up Exercises, Meditation Tips. Planting posture activates the muscles and nerves in the Triple Warmer area, an imaginary region of the torso (see the photo below). The Triple Warmer area consists of the upper warmer (between the glottis and diaphragm), middle warmer (between the diaphragm and navel), and lower warmer (below the navel). This exercise strengthens and stretches the muscles in the Triple Warmer area simultaneously, and stimulates the nerves of the region by inward twisting of the arms. 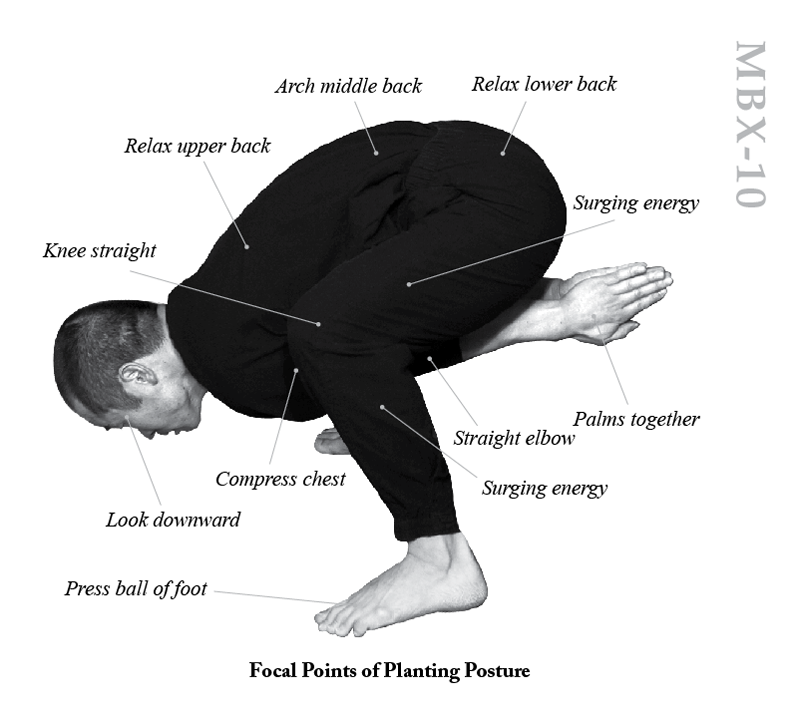 MBX 10: Planting Posture helps you improve strength and inner power. From natural stance, turn your toes outward and lower your posture. Bring your palms together and place them in front of your chest (variation: stretch your arms in front of you). Inhale deeply. Exhaling, slowly bend your torso forward, insert your arms between your legs and reach far backward (like someone is pulling your arms). Inhaling, twist your arms and hands inward, so the backs of your hands are facing each other. Exhaling, slowly lower your body as best as you can. Look at the floor. Keep your head and hands horizontal. Hold this position for 3-5 seconds. Inhaling, slowly raise your body to natural stance. The Triple Warmer, a virtual energy space in the torso, is believed to integrate and control the flow of oxygen, blood, nutrients, and excretion. Regarded as one of the six organs in meridian theory, it is the central hub of inner energy in the body. The Upper Warmer, including the heart and lungs, transports oxygen and nutrition. The Middle Warmer, consisting of the spleen, stomach, and liver, is involved in digestion, absorption, and blood production. The Lower Warmer, comprised of the kidney, large intestine, small intestine, and bladder, filters metabolic by-products. 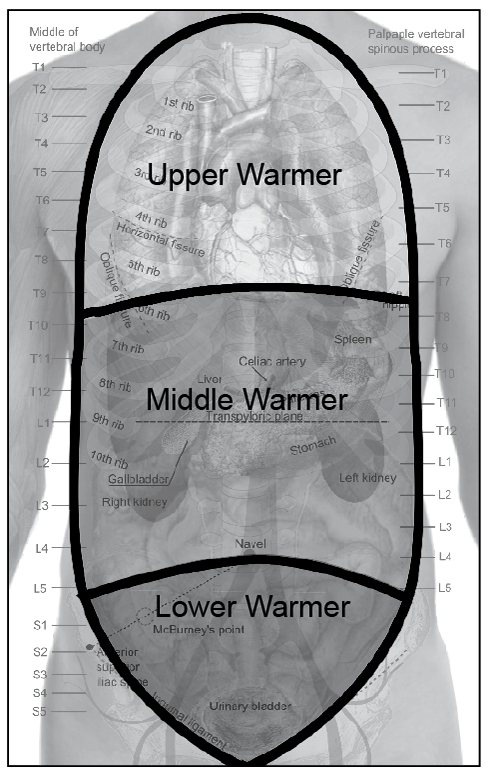 The Triple Warmer has three regions: upper (neck to diaphragm), middle (between diaphragm and navel), and lower (below navel) warmers. The Upper Warmer, consisting of the heart and lungs, is responsible for regulating the circulation of blood and oxygen. The Middle Warmer, consisting of the spleen, stomach, and liver, controls digestion. The Lower Warmer, consisting of the kidneys, small intestine, large intestine, and bladder, regulates excretion. The three sections are divided by the diaphragm between the upper and middle areas and by the navel between the middle and lower regions. Planting posture is an act of planting a seed of energy in the torso by wringing out the force from the legs and arms, and collecting it in the center of the body. 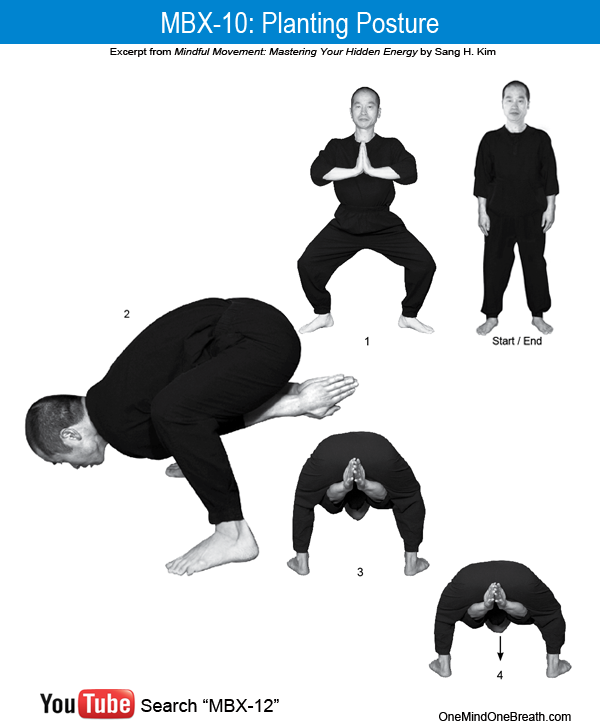 The most beneficial part of the movement is the Low Squat (photo 4), in which you twist the arms with the palms facing outward, lowering your body as close to the ground as possible. This requires strength. You may reduce the intensity of the movement as needed to fit your physical condition. Move slowly and mindfully, without hurrying. Be open to fresh feelings rising from every inch of your movement, from the toes and thighs to the chest and head. Done right, Planting posture increases circulation and body heat. Move slowly, in the way you feel comfortable. Although this posture appears to be hard to practice, if you do it mindfully, without hurrying, it is no different from looking under the bed for your cat. Along the way, you will find yourself becoming stronger. Be open to fresh feelings rising from every inch of your movement. Going one step further, listen to what every fiber in each moving muscle tells you. When you are open to it, you will be able to sense it, and regulate it for your optimal experience. Caution: If you experience cramping or dizziness slowly lower yourself to your knees or lie back and rest. This entry was posted in MBX Project, MBX-12 Workshop, MBX12, Mindful Movement and tagged Breathing Methods, Energy Meridian, How to Boost Energy, Inner Power, muscle contraction, Planting Posture, Sang H. Kim, Strength, Tripple Warmer. Bookmark the permalink.